I want to make this diamond border whereas the "finished" border is 3 1/2 inches. 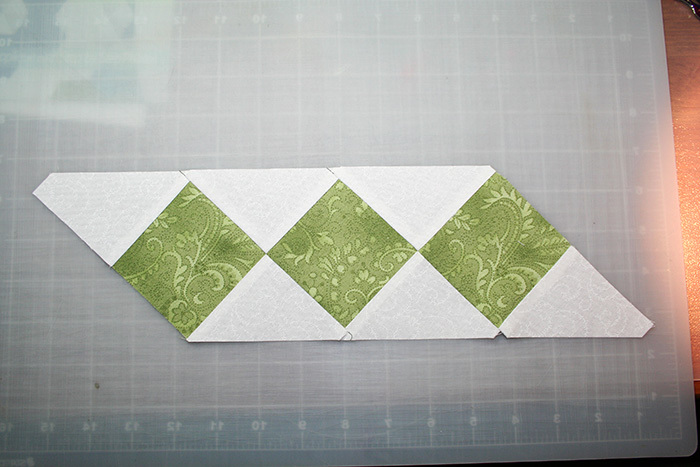 I want to use this strip piece method, however, I have no idea how wide to make the "dark" strip and the "light strip" as shown in the instructions ( http://www.quilterscache.com/H/HarlequinBorder.html ). Last edited by PatriceJ; 07-27-2013 at 12:44 AM. Check QuiltersCache.com ... and look at their borders. They have this style of border and many others, along with the instructions. QULTE - thank you so much for your reply! My question was (See EXAMPLE) in my attachment. Where it says "for a roughly 4" border, cut center strips 3 1/5 inches wide and cut the outer strips 4" wide. This is directions for a finished 4" border. I want a finished 3 inch border , what size do I cut the center strip and what size do I cut the outer strips? Last edited by QuiltnNan; 07-26-2013 at 02:23 PM. ​I would get out some construction paper and cut the pieces without seam allowances. I would trim the paper squares until I got my desired border size. I would then add the seam allowances and figure out my fabric squares. Ditto to Tartan ... I would draw it out on paper or use construction paper, minus seam allowances. Then once I thought I had it figured out, I would try it with fabric (remember to add the seam allowances) ... but not my quilt fabric, just in case my calculations were wrong! I've got an idea that may interest you. 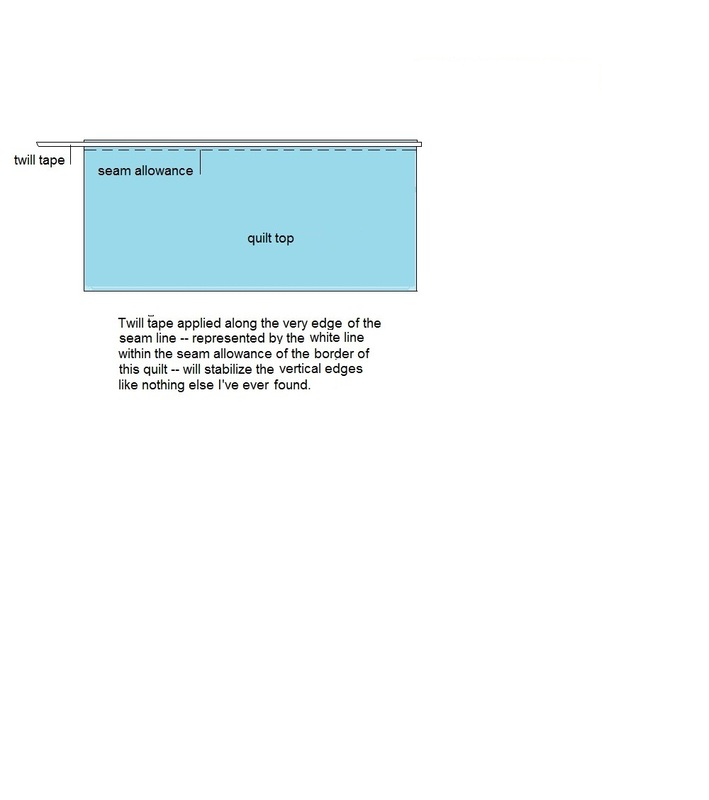 Try this trick of using 1/4" twill tape within the seam allowance to stabilize those bias vertical and horizontal edges. Twill tape comes in little packages like rickrack; you need several depending on how long your borders are. Okay at one point you said 3", at another point you said 3.5". If you cut your strips at 3" you will end up with a 3.5" border. This sample I made measures 3.5" at the top and bottom corners of the green fabric, and the whole section including the white fabric measures 4". If you want your finished border to measure 3", you will want to cut your strips at 2 1/8". Peckish, that's it! I am going to get started right away. Thanks, so much. The picture really helped me understand, you are a gem! I'm glad it helped, but I'm not sure how my picture was any different from the one in your link.